Cycle superhighway: 'If something doesn’t change I’ll have to close for good" | West Leeds Dispatch | News. Views. Get involved! Businesses in Stanningley are facing major disruption to trade – with some owners fearing for their livelihood due to work on the £29 million Cycle Superhighway, writes Lily Marchesi. The work towards building the bespoke cycle lane between Leeds and Bradford has involved digging up sections of Stanningley Town Street to resurface the road. Traders say the work has impacted greatly on parking in the area, with one trader fearing he may have to close. “The lack of parking is the biggest concern and has resulted in a 50% loss in trade for us. Mr Bennett, along with other local business owners, say they have made suggestions at various consultation meetings about the project but don’t feel like their parking concerns are being listened to. Mr Campey claimed shoppers were avoiding the area due to the roads often being gridlocked. Issues surrounding communication in the project was raised at a meeting in Armley last week when local residents and business owners met with representatives of Leeds City Council. Oliver Priestley, head of engineering projects at the council, recognised that there have been issues regarding information being passed on. “We appreciate that there is disruption to residents and businesses as a result of the current improvements to Stanningley Bottom, but we believe that these works will improve the area and bring about economic growth. “We have already been complimented on the works so far by some locals. “We have worked closely with both residents and business owners during the design and delivery of the scheme and sought to accommodate parking and access needs during the build process and within the final scheme. “We have addressed long-standing parking problems, including blind spots and pavement parking and will be introducing parking restrictions to improve the turnover of spaces for local businesses. “In addition to this we are also adding more spaces in Stanningley Bottom car park and improving the signage and visibility. The cycle superhighway aims to encourage more people to take up cycling and make it a popular alternative for commuters. It also aims to build on the legacies of the Tour de France, which held its Grand Depart in Leeds last year, as well as helping to cut pollution by reducing the number of cars on the road. 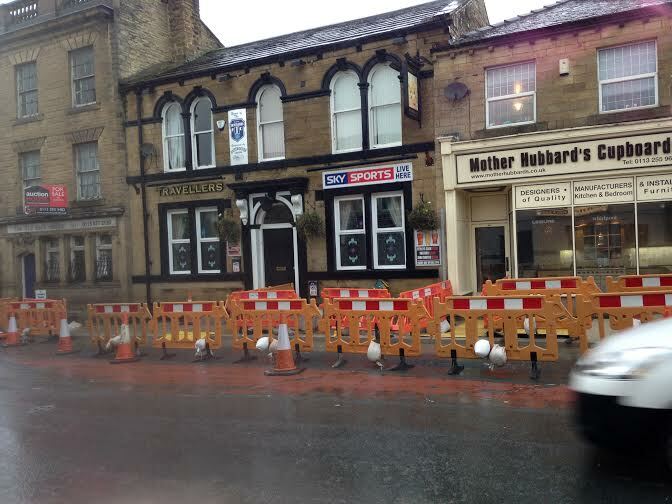 Stanningley Town Street is temporarily closed on Sundays while construction work is carried out. We feel that the disruption caused to traffic and businesses is only going to benefit a few. How many cyclists are going to use the cycle lanes?? In reality we can’t imagine that many people are going to go out and buy a cycle just so that they can use it. I agree that cyclists need to be safe but the ones already on the road need to help motorists by wearing high visibility clothing and good lights on the front and back of their cycles. Some do and are easily seen but last week I passed 2 cyclists wearing dark clothing with no visible lights on the back of their cycles at 7pm. Whilst passing some of the roadworks the other day 2 our Grandchildren asked how much the Cycle superhighway was costing. When they were informed they said that surely that money would benefit more people if it was spent on Education and the NHS!!! These children are 12 and 13 years of age. Rather an astute observation for ones so young. Maybe there should have been some consultation before this amount of money was assigned in this way. Does anybody know roughly how many cyclists are likely to use all this roadway that has been allocated to them. The roads through some areas, Stanningley being one of them, are going to be narrowed so much that it will be difficult for buses to pass alongside each other never mind juggernauts etc. The congestion is bad already, we can only see this getting worse. Sorry to be so negative but we are not the only people thinking this way. When travelling on the bus we have overheard many similar comments. It’s awful to think we are spending 29 million on a cycle lane when hospital wards for premature babies need 1 million to stay open yet we cater for cyclists ? Who don’t even pay road tax ! It’s beyond ridiculous !! You are not paying for it. The money is coming directly from the EU. The money would never have been used for anything else. Er….and where does the EU get its money from? You do not pay road tax, you pay vehicle excise duty: A duty levied on a high-impact form of transport to offset the environmental costs caused by it. People who ride bikes have no such impact and therefore pay no extra duty. The biggest cost to the NHS in the future will be treating obese people and their related illnesses. All research shows that every £ spent on walking and cycling will save the NHS £10 if we can reduce obesity. What we are doing now isn’t working and it will mean that for the fist time in human history our children live shorter lives than us. Something has to change. Open your minds before it is too late. As a new business on Stanningley Road we have worked so hard to try gain a decent reputation and repeat custom. In August we were delighted with the way the business was going and took on extra staff and we thought that we were finally starting to make a success. Then the works arrived outside. It took us months of relentless emails to get an answer to our enquiries and even since then the lack of communication has been appalling. As two young women in our twenties, trying to bring a quality establishment to the area we are bitterly disappointed with how we have been treated. We have also had to let staff go which is not at all pleasant for anyone involved. We’re now being told the work will be completed in April after intially being advised it would be done by January. It’s so disheartening. I am annoyed and frustrated about losing business due to the roadworks and there being nowhere to park, and women not wanting to walk through dark streets for their hair doing and not feeling safe because they can’t get close enough, I see 2/3 cyclists roughly a day it is not worth what they are spending, a nice cycle lane with loads of closed down businesses around it is what stanningley is looking at! The most cyclists we have counted in a day is 5. I tried to cycle into Leeds earlier this year. It was terrifying. I can’t wait for the new lanes to open so that I can try again. While I broadly welcome the scheme itself – and its aims of getting people out of cars – reading the comments here it seems like it’s causing chaos with local businesses. It would seem whatever its merits (or otherwise) are the development seems disgracefully handled by the powers that be. In this world of obesity & with cases of diabetes on the increase, I agree that we should encourage a fitter, healthier society & I do understand that in order to do this cyclists need to feel safe. I do wonder though what thought process went into the planning of the lane itself? The new layout around Stanningley is a joke! It has just become one big obstacle course for drivers & in my opinion, down right dangerous! Who’s idea was it to force a driver to the opposite side of the road when turning left onto a main carriageway? (referring here to the side streets near the Jug & Barrel). These new ‘parking bays’ have not only reduced the available parking spaces but have made it difficult to negotiate the road. It will be fun too when it snows, & we can’t see where the boundary is! Is this obstacle course to be marked with bollards or lit on a dark night, I wonder? Cyclists may ultimately feel safer but as a driver I feel nervous, especially when one of those bendy buses is heading straight for me. There’s just not enough room for two of us & when you’re a big bendy bus, right of way seems to go out of the window! This cycle lane is an absolute joke. Construction has been going on for nearly a year now and it is nowhere near complete. According to City Connect it is not due to be complete until April 2016. City Connect should be forced to provide daily construction updates via their social media channels, and they could start by telling us how many people they actually have on the ground building this thing. Totally agree with those who say communication on this project has been appalling. My biggest issue with this project (apart from the massive disruption) is the way the already traffic clogged roads of West Leeds have been reduced in width in order to accommodate this cycle lane. I have witnessed emergency vehicles trapped and unable to get through rush hour traffic because of this. This whole scheme is just so downright dangerous I cannot believe anyone thought this scheme was a good idea. I would love to know who has given the council positive feedback about the works, as I have yet to speak to anyone that has anything but the opposite to say. There are many small businesses along stanningley road that now have no access to those in cars due to the built up kerbs between the road and the cycle lane, as they have no option to pull over anywhere. At a time when our country is still trying to get back on its feet financially, it’s a shame to see the ‘powers that be’ giving so little thought to those trying to earn a living, and spending so much of our valuable resources in the process. I don’t normally reply to comments sections on news sites, but the discussion here so far seems calm and well-mannered so I’ll make an exception! Before I start I’ll admit that I’m a cyclist (also a motorist/pedestrian) and broadly in favour of the project. Firstly, the cost. Yes, it’s quite expensive at a time when the council and the government are making as many cutbacks as they possibly can. This project needs to be thought of as a long term investment. Multiple studies have shown that spending money on cycling infrastructure saves more in other areas. The obvious saving is to local health budgets, but people who cycle to work also tend to be more productive and have less sick days. I’ve seen a lot of comments (not just here) along the lines of “I’ve only seen x cyclists on that road therefore it’s a waste of money”. I won’t argue that not many people are using the route currently. That’s because Stanningley Road is awful to cycle on in its current form. It was bad before the road works and it’s even worse now that they’re underway! Once the route is finished I think everyone will be pleasantly surprised at the number of people cycling on it. You only need to look at how many are using the newly resurfaced canal towpath to see what is possible. The other thing to note here is that this infrastructure isn’t just for people who are already cyclists. It’s for the people who would maybe fancy nipping into town or to the shops but don’t particularly want to mix with traffic. Surveys have shown the demand is there, it just needs safe infrastructure. CityConnect however is not above criticism. I think the lack of communication has been awful. Their twitter feed and website are full of all kinds of updates about things that are vaguely cycling related, but trying to get information about the superhighway is like getting blood from a stone. There’s been precious little information since the consultation phase. Even just a fortnightly update on the website would be something. I also have concerns about some of the route itself. Stanningley Bottom seems like the planners looked at the route, decided it was too narrow and then just went ahead anyway. That section will end up pleasing no-one. Overall though I think it’ll be a positive development for Leeds and I sympathise with the businesses along the route that are affected by all the disruption. I’ll be sure to pop along to Café 53 when I get the chance! Thanks for your comments, Paul. And everyone else for that matter! It’s always good to hear about other people’s experiences. We’re not opposed to the scheme and as a family very involved with the groundworks/construction industry, we are delighted that this is giving work to so many people at a time of year that can be difficult due to the expense of Christmas and weather affecting work. We understand that perhaps with time the cyclists will start to appear as the work finishes but we feel that there perhaps wasn’t/isn’t the demand that has been implied. I certainly hope that the scheme is a success but after hearing (directly from people involved with the scheme) about how over budget the project has gone (we have heard figures ranging from £28m up to £91m) whilst small businesses are suffering it makes us feel very frustrated and disappointed. We were actually told that LCC/City Connect ‘has bigger fish to fry’. We were also assured at the meeting last Tuesday that someone would be contacting/visiting us to update us on what is happening and explain to us why cones are located where they are despite works not currently being carried out. This has not yet happened – indeed making us further feel that small businesses are not being taken seriously. That being said, we are not giving up. We will continue trying to serve homemade, top quality food with a side order of friendly chat and hope that things pick up for us again! Cycle tracks improve motor traffic flow and increase takings of businesses along the route. I travel this route by bus, I agree that the road works seem to have been going on for ages! Inspired by the Tour de France I did try cycling to work on this route, but the experience, fighting with the traffic, was so awful that I quickly I stopped. I’m looking forward to the cycle track being finished, and to spending some of the money I save (and to replacing the calories I burn) in Café 53. Totally agree with you. Leeds City Centre plays host to the start of a bicycle race for 1 day in 2014 and some bright spark in the Civic Hall decides we must have a “legacy” and the residents of West Leeds have to then endure 1 year of disruption to their lives. This is a simple quality of life issue for me. That part of Stanningley is shocking for parking, hopefully this cycle lane gets rid of the parking spots so that it’s not chaos the drive past. The whole situation is a complete farce. Businesses are suffering and residents suffering and NOBODY in the Council cares. Stanningley is and always has been the “cinderella” of the area. Town Street is now so narrow but the HGV traffic, 72 bus and endless cars are creating mayhem and for surrounding streets too. Why bother with Public Consultations when the views of the public are ignored? Calm … down, it will be fine. Cyclists also spend money you know. Look at other pedestrianised areas. Look at other countries. Note: This comment was edited to remove profanity. therefore, can we expect an explosion of Lycra outlets along the route? Where are we able to buy a Kebab? Councillor rod wood says £10M of council tax money is being spent on this which is twice the annual spend on footpaths and road maintenance. I’d be extremely interested to know exactly how many cyclists/drivers/pedestrians have expressed any desire to travel to Bradford. As an ex cyclist ,I would be absolutely terrified to pedal down Leeds Road,as the Road Traffic Act does not appear to apply after Thornbury.